Art with electronically drawn content. 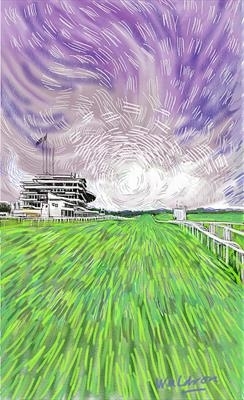 A drawing on the iPad of the course at Epsom shortly before the Derby in 2016. This is then open to a limited edition print run. Clearly there is no one off canvas as with conventional painting and the only way to commit to paper is through giclee printing on the finest paper or canvas - at the buyers wish. This work creates the feeling that a jockey has as he leads the field in an important race - as the Derby - in England, United Kingdom. It might apply to anywhere in the world except that the drawing here is of the grandstand towards the finishing line.